People have been comparing Brexit to a messy divorce since before Brexit was Brexit, but I suspect we may be in the wrong movie. The Tory Eurosceptic claim is, effectively, that they were never really married. And that means that we need to draw our clichés from a whole different realm of romantic fiction. Think of Bull Johnson, an emotionally immature man with a steady but not sensational income. He’s been involved with a woman (let’s call her Europa) who lives nearby, and they get along pretty well. But he has this dynamic and very successful friend, Merry, who he used to be close to, but who now has her own life on a distant continent. They still talk often, share secrets (ahem), and occasionally lean on each other in hard times. Merry thinks that Bull should finally commit to Europa and settle down. (Europa has some reservations as well, having had some unfortunate encounters with Bulls in the past, but thinks this relationship can work.) And he does, sort of. Then one day Bull calls up Merry and says, I’m thinking of leaving Europa. I hate feeling tied down. I want my old “buccaneering” life. What does that even mean? asks Merry. He can’t say, but he insists he misses his old life. Merry says to think about the good life he and Europa have built together. Bull agrees that he’ll give it some more thought, and have a talk with Europa about what he’s dissatisfied about. This seemed like a significant disagreement. And I thought, either this reflects a change of position — perhaps with more information implicating the Russians — or Rex is freestyling. Presumably Tillerson is speaking for the state department professionals and the White House is speaking for… Well, let’s just say that Vlad would want to see some evidence that Donald hasn’t forgotten who he’s working for. I was expecting there to be some sort of demeaning tweet about Tillerson’s height or his body odour, or something. Weird coincidence. Even if Tillerson’s ouster actually had been planned long in advance, it’s pretty obvious that a small delay would have prevented this appearance of truckling to the Kremlin’s interests. Which means that, whatever else may have motivated this step, that appearance was almost certainly desired. Speaking on Thursday night, the prime minister said both sides needed an “outcome that we can stand behind and defend to our people”, hinting at the political difficulty she would have in selling a deal that involves handing over a large sum to the EU. Translation: We made unrealistic promises to our people. Now it’s up to you to fulfill our promises. In the name of democracy. As I recall, another European leader recently tried to reject financial demands from international organisations by appealing to the spirit of democracy and the results of a popular referendum. I wonder how that one turned out? These Americans represent the new Roman empire and we Britons, like the Greeks of old, must teach them how to make it go. I guess, after the last dreams of empire fade, the British establishment can still grasp for the hope of becoming the new Athens. I love Der Spiegel, I consider it one of the best sources for international news, in addition to (of course) news about Germany, and it has to some extent maintained the idiosyncratic playful and sophisticated language style of its founder. I’m not usually wild about its graphics, though, and find it dull and obvious, as well as straining to find a reason to associate an image of naked breasts with any article. 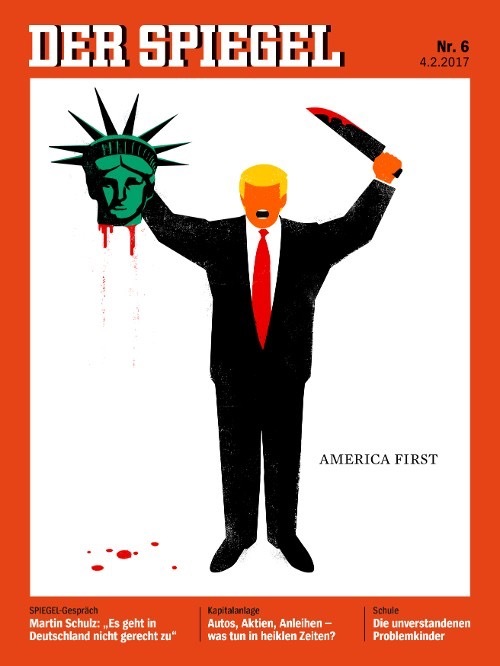 The association with Daesh puts the “America First” slogan in a different light as well. It’s a slogan that the murderers of the self-proclaimed caliphate could share, in the same spirit as the terrorist narrator of Leonard Cohen’s song, First we take Manhattan, Then we take Berlin. It’s not even inappropriate, given that Stephen Bannon and his cronies have been fairly open about their intention to use Trump as the point of the spear to destroy liberal democracy in Europe, in favour of white ethnonationalism. 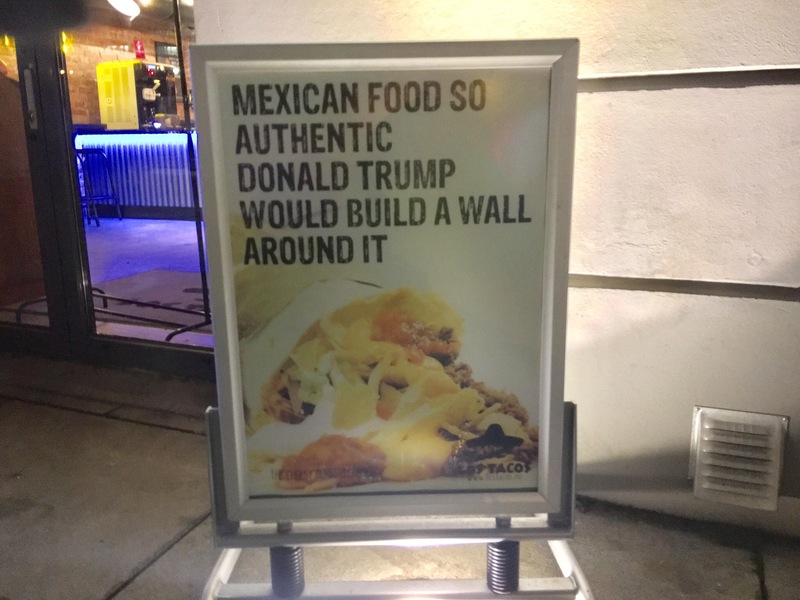 Author steinsaltzPosted on February 4, 2017 February 5, 2017 Categories Politics, Satire, SocietyTags art, Germany, international, journalism, law, satire, Trump, US politicsLeave a comment on Who’s on first? The State Department drafted its own statement last month marking International Holocaust Remembrance Day that explicitly included a mention of Jewish victims, according to people familiar with the matter, but President Donald Trump’s White House blocked its release. Together with the Trump administration’s decision that they really don’t like Israeli settlements, I wonder if the right-wing orthodox Jews and Israelis who thought they had the measure of the man are beginning to feel like building contractors on a Trump hotel project. Who are you calling illegal? The use of the term “illegal immigrants” has long been a point of contention between the right (who like the stigmatisation it implies) and the left (who don’t, and prefer terms like “undocumented immigrants”) in the US. The racist right likes to go further and simply call the people “illegals”. Whatever the politics or the human considerations, at least it’s not entirely inaccurate when applied to people who crossed the border without proper clearance, or who overstayed their visas. How can anyone think it appropriate to call asylum seekers for whom an agreement has been negotiated by the US president to bring them legally into the country “illegal immigrants”? Except, of course, that for the racist right — of which DJ Trump is a charter member — illegal is not a legal description, but simply a term of aspersion against nonwhite people without large real estate portfolios who cross borders. Author steinsaltzPosted on February 2, 2017 February 2, 2017 Categories PoliticsTags asylum, diplomacy, international, language, migration, Trump, US politicsLeave a comment on Who are you calling illegal? 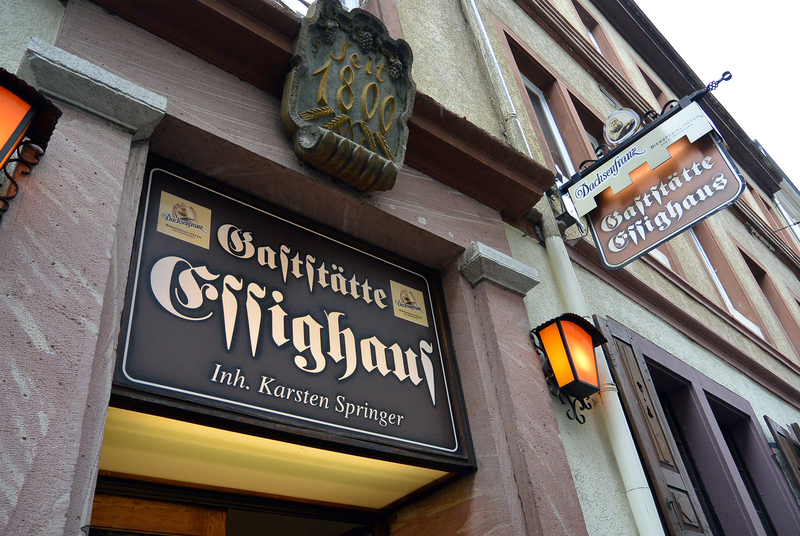 I noticed this sign the other day in the Ruhr city of Hagen. 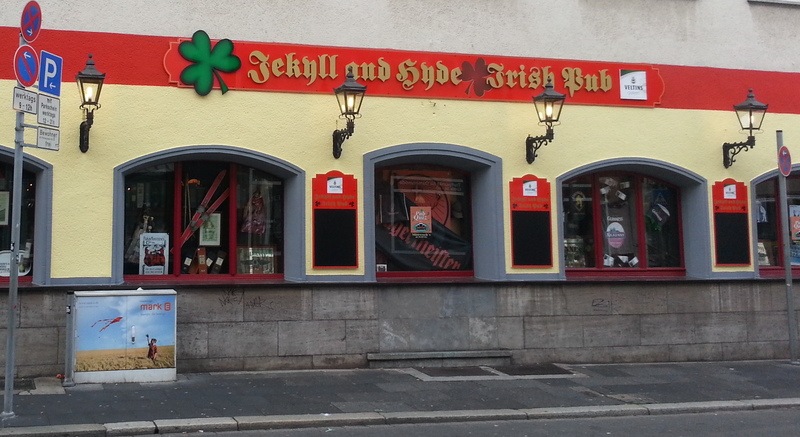 It’s an Irish pub whose sign uses a sort of Gothic script that otherwise is used in Germany as a marker of conservative German gastronomy (as on this restaurant in Munich, since 1800), and that is used on pubs and restaurants elsewhere simply to signify “German”, particularly beer. Here, it’s Irish for some reason. And on top of that, this Irish pub is named for a quintessentially London character (or is it two characters?) in a novel by a Scottish author. At least they got the shamrock right. Unavoidable chaos in the NHS? The problem is, a rule introduced in 2011 requires that foreign workers must return home after 6 years if they are not earning over £35,000. This is presented a disaster that can only be averted by the government granting an exemption to the rules. The union says that by 2017 more than 3,300 NHS nurses could be affected. And by the end of the decade the numbers could be double that – a potential waste of nearly £40m when all the costs of recruitment are taken into account, the RCN says. RCN general secretary Peter Carter said: “The immigration rules will cause chaos for the NHS and other care services. He told BBC Radio 4’s Today programme the move was “totally illogical” as there is currently a “major shortage of nurses”, leading to many NHS trusts spending “tens of millions” to recruit from overseas. Dr Carter also stressed that most nurses earn “nowhere near” £35,000, with most on salaries of between £21,000 and £28,000 a year. Author steinsaltzPosted on June 22, 2015 June 22, 2015 Categories Politics, SocietyTags economics, health policy, international, UK politicsLeave a comment on Unavoidable chaos in the NHS?